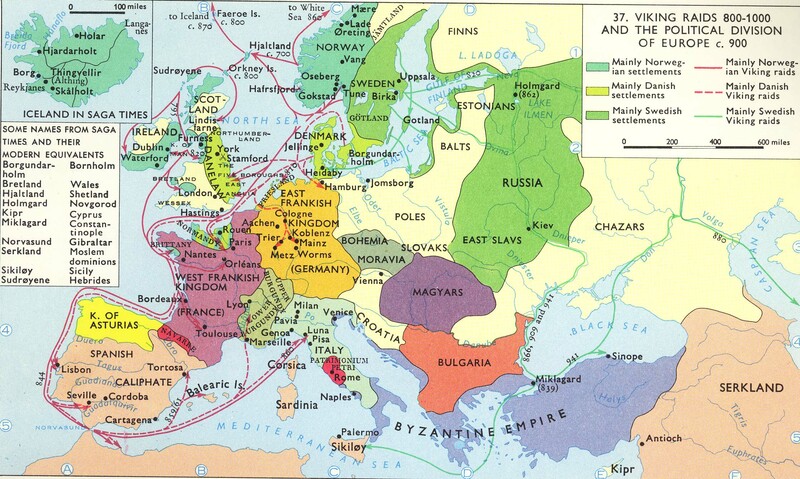 In 844 A.D., Norsemen raiders (commonly referred to as “Vikings”) attacked al-Andalus, sacking Cadiz, Lisbon, Medina Sidonia before capturing Seville. They maintained their control over Seville for a little over a month before being defeated by an army sent by the Umayyad emir, ‘Abd al-Rahmān II (r. 822–852) to repel them. The battle, according to most accounts, was quite fierce and ended in the victory of Andalusi Muslims over a large Viking force consisting of about 15,000 men. 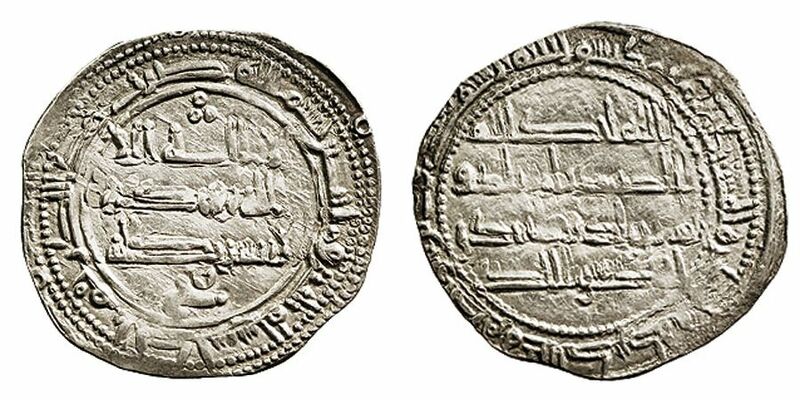 Following the retreat, the emir—recognizing the vulnerability of his kingdom to raids and seeking to avoid future confrontations within his own territory—ordered the construction of a navy (the first of its kind in al-Andalus) and sent emissaries to initiate peace talks with the Vikings. There is a lot of dispute about the origins of the Norsemen who reached al-Andalus. If they were Norwegian, their raids would most likely have been launched from Ireland, while Danes would have most likely have set out from the territory comprising modern-day Denmark. The surviving account of the Andalusi embassy—included below (which is a slightly revised version of W.E.D. Allen’s)—is also ambiguous on this point and mentions only that the Norse monarch’s court was located on an “island” (which could signify either Ireland, where the chieftain Turgesius/Turgeis [d. 845)] was based, or the island of Zealand, where the court of King Horik I [d. 854] was located). I am personally inclined to believe that it was to the Vikings in Ireland that this account refers, due to some of the details provided within the text. The Andalusi diplomatic mission was led by a renowned poet and courtier—Yahya b. Ḥakam al-Bakrī (better known as al-Ghazāl)—who had earlier been sent as a diplomat from Umayyad Cordoba to the Byzantine Emperor Theophilus (r. 829–842). 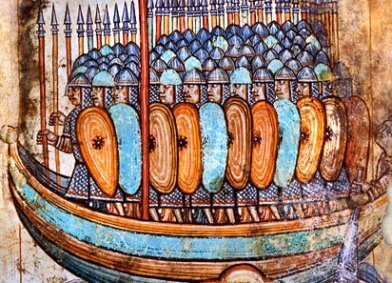 The mission carried gifts for the Viking king and his wife and sought to establish a truce in order to avoid future Norse raids on al-Andalus. In any case, it seems that the embassy had little long-term impact since the Norsemen would carry out a major raid against Iberia in 859, only to be repelled by the well-armed Andalusi navy that would not allow a repeat of the disaster of 844. The only detailed account of the mission is preserved in a much later Andalusi source—the poetic anthology by Ibn Dihya al-Kalbī (d. 1235) entitled al-Muṭrib min Ash’ār Ahl al-Maghrib—which throws many of the details into question. Since the account survives only within a text compiled nearly 400 years after the fact, many scholars have, rightly, questioned the authenticity of the narrative and, others, have even doubted whether there was even an embassy sent to the Vikings from al-Andalus at all. For those wishing to read more about the various debates about this embassy and the authenticity of the narrative, read W.E.D. Allen, The Poet and the Spae-Wife: An Attempt to Reconstruct al-Ghazal’s Embassy to the Vikings (Kendal: Titus Wilson and Sons Ltd., 1960), pp. 1–18. In any case, whether or not one accepts the text as a faithful rendering of the embassy, it makes for an interesting read! For one thing the account, in contrast with Ibn Fadlan (who designates them Rūs), refers to the Norsemen as majūs (the Arab-Islamic term for “Zoroastrian) and ascribes distinctly Zoroastrian practices—“fire-worship” and the marriage between siblings—to the pre-Christian Norse faith. Even more interesting is his claim that the Vikings had converted to Christianity, although this is not known to have happened until the tenth century. The close relationship that al-Ghazāl develops with Nud, the Viking queen, is also quite noteworthy (even if highly embellished) and occupies the bulk of the account. Moreover, the mention of the role of al-Ghazal as an intermediary between the Norse chieftain/king and the king of Asturias (Ramiro I, r. 842–850) is a curious detail. The most fascinating aspect of the text, however, is how—in contrast to the image of the uncultured Viking barbarian that one encounters in the Latin and Arabic chronicles—the Norse court is described as rather civilized, with court scholars present (referred to as ‘ulamā’) who engage al-Ghazāl in intellectual debate and (possibly?) religious disputation. When al-Ghazāl was saved from the terror and dangers of those seas, he arrived at the first of the lands of the Vikings (bilād al-majūs), at one of their islands, where they stayed several days and repaired their ships and rested. 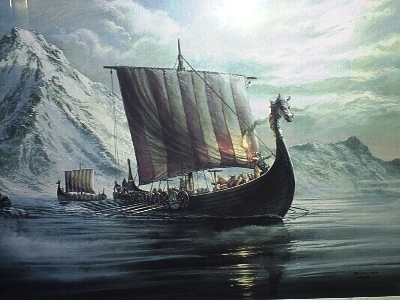 The Viking ship went on to their king and they informed him of the arrival of the envoys. At this he rejoiced, and sent for them, and they went to his royal residence which was a great island (or peninsula) in the Ocean, with flowing streams and gardens. It was three days’ sail, that is, three hundred miles, from the mainland. In it are Vikings, too numerous to be counted, and around the island are many other islands, large and small, all peopled by Vikings. The adjoining mainland is also theirs for a distance of many days’ journey. They were heathens, but they now follow the Christian faith (dīn al-naṣranīya), and have given up fire-worship and their previous religion, except for the people of a few scattered islands of theirs in the sea, where they keep to their old faith, with fire-worship, the marriage of mothers and sisters and various other kinds of abomination. The others wage war against them and enslave them. The king ordered his people to prepare a fine dwelling for them [the Andalusi emissaries], and sent out a party to greet them. The Vikings thronged to look at them, and they wondered greatly at their appearance and their garb. They were then led to their lodgings in an honorable manner and spent a day there. After two days the king summoned them to his presence, and al-Ghazal stipulated that he would not be made to kneel to him and that he and his companions would not be required to do anything contrary to their customs. The king agreed to this. But when they went to him, he sat before them in magnificent guise, and ordered an entrance, through which he must be approached, to be made so low that one could only enter kneeling. When al-Ghazal came to this, he sat on the ground, stretched forth his two legs, and dragged himself through on his rear. And when he had passed through the doorway, he stood erect. The king had prepared himself for him, with many arms and great pomp. But al-Ghazal was not overawed by this, nor did it frighten him. He stood erect before him, and said: “Peace be with you, O king, and with those whom your assembly hall contains, and respectful greetings to you! May you not cease to enjoy power, long life, and the nobility which leads you to the greatness of this world and the next, which becomes enduring under the protection of the Living and Eternal One, other than whom all things perish, to whom is the dominion and to whom we return” [Q. 28:88]. The interpreter explained what he had said, and the king admired his words, and said: “This is one of the wise and clever ones of his people.” He wondered at al-Ghazāl’s sitting on the ground and entering feet foremost, and he said: “We sought to humiliate him, and he greeted us with the soles of his shoes. Had he not been an ambassador, we would have taken this amiss.” Then al-Ghazāl gave him the letter of Sultan ‘Abd al-Rahmān. The letter was read to him, and translated. He found it good, took it in his hand, lifted it and put it in his bosom. Then he ordered the gifts to be brought and had the coffers opened, and examined all the garments and the vessels that they contained, and was delighted with them. After this, he permitted them to withdraw to their dwelling, and treated them generously. Al-Ghazāl had noteworthy sessions and famous encounters with them, in which he debated with their scholars and silenced them and contended against their champions and outmatched them. The queen was greatly pleased and elated with this, and ordered him a gift. Al-Ghazāl refused to accept it, saying “I will not.” Then she said to the interpreter: “Ask him why he does not accept my gift. Does he dislike my gift, or me?” He asked him — and Ghazāl replied: “Indeed, her gift is magnificent, and to receive it from her is a great honor, for she is a queen and the daughter of a king. But it is gift enough for me to see her and to be received by her. This is the only gift I want. I desire only that she continues to receive me.” And when the interpreter explained his words to her, her joy and her admiration for him grew even greater, and she said: “Let his gift be carried to his dwelling; and whenever he wishes to pay me a visit, let not the door be closed to him for with me he is always assured of an honorable welcome.” Al-Ghazāl thanked her, wished her well and departed. Tammām b. ‘Alqama said: “I heard al-Ghazāl tell this story, and I asked him: ‘And did she really approach that degree of beauty which you ascribed to her?’ And he answered: ‘By your father, she had some charm; but by talking in this way I won her good graces and obtained from her more than I desired’.” Tammām b. ‘Alqama also said: “One of his companions said to me: ‘The wife of the king of the Vikings was infatuated with al-Ghazāl and could not suffer a day to pass without her sending for him and his staying with her and telling her of the life of the Muslims, of their history, their lands and the nations that adjoin them. Rarely did he leave her without her sending after him a gift to express her good-will to him — garments or food or perfume, till her dealings with him became notorious, and his companions disapproved of it. With which you struggle as if with a lion. Who will not let the sun of beauty set, who lives at the limit of God’s world, where he who goes towards her, finds no path. If I should say one day that my eye has seen any one like you, I would surely be lying. It was as though it had brought me back to my youth. As a sun that is swathed in mist. And the covering begins to fade away. Mariano G. Campo, ed. Al-Ghazal y la Embajada Hispano-Musulmana a Los Vikingos en el Siglo IX. Madrid: Miraguano Ediciones, 2002. Anne Kormann and Else Roesdahl, “The Vikings in Islamic Lands.” In The Arabian Journey: Danish Connections with the Islamic World over a Thousand Years, ed. K. von Folsach, T. Lundbaek, and P. Mortensen (Aarhus: Prehistoric Museum Moesgard, 1996). Eduardo Morales Romero. Historia de los Vikingos en Espana: Ataques e Incursiones contra Los Reinos Cristianos y Musulmanes en la Peninsula Iberica en los Siglos IX-XI. Madrid: Miraguano Ediciones, 2004. There is similarity between Viking mythology and islam possibly because they picked it up from us, their religion was largely oral relying or tails and stories so it isn’t unlikely some of it worked it’s way into their culture as Islamic accounts spread. They have something similar to the bridge sirat and other things in the akhira and day of judgment, and it would not be surprising that trade with Islamic lands allowed them to make, or purchase, the superior weapons they used when they invaded England and other parts of the world. The 13th warrior is a movie based on one ambassadors trip into Viking lands. Ahmad ibn Fadlān ibn al-Abbās ibn Rāšid ibn Hammād was a 10th-century Arab traveler, famous for his account of his travels as a member of an embassy of the Abbasid Caliph of Baghdad to the king of the Volga Bulgars. In 844 A.D., Norsemen raiders (commonly referred to as “Vikings”) attacked al-Andalus, sacking Cadiz, Lisbon, Medina Sidonia before capturing Seville. They maintained their control over Seville for a little over a month before being defeated by an army sent by the Umayyad emir, ‘Abd al-Rahmān II (r. 822–852) to repel them. Wow. The Ummayads must have had some crappy walls around their cities to be taken by Vikings. Good God. It’s always interesting reading of such escapades, particularly after having been brought up with whitewashed Islamic school ideas of past Muslims – so much for “lowering the gaze” and “not mixing with the opposite gender”! Fascinating story. All that flattery of a young woman by a man in his 50s – just a tiny bit creepy? Just wondering if it is possible that Al-Ghazal travelled as far as Denmark, from the description of the many islands/possibly a peninsula and the mainland being under their rule for a certain distance? I know it’s a lot further than the 300 miles mentioned but, if the Vikings had indeed come all the way from Denmark, it might have been embarrassing for the Andalusi to admit that their cities could be threatened by raiders so very far from home. All that flattery of a young woman by a man in his 50s – just a tiny bit creepy? You think 50 year old men are only attracted to 50 year old women? Of course not. I’m 47.